Properties in Copenhagen average 4.4 out of 5 stars. Vesterbro is the most happening, trendy and urban area in all of Copehagen. 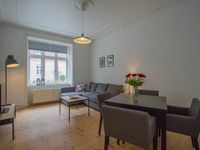 Property 5: Vesterbro is the most happening, trendy and urban area in all of Copehagen. AMAZING 200 SQM APARTMENT OVERLOOKING THE CANALS OF COPENHAGEN. 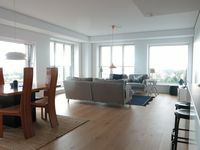 Property 37: AMAZING 200 SQM APARTMENT OVERLOOKING THE CANALS OF COPENHAGEN. Cozy and Modern Flat with Great View of The Lakes! Property 48: Cozy and Modern Flat with Great View of The Lakes! Property was perfect for us, a couple with two kids (6 &amp; 10). The pull out couch is the size of a double bed or larger and there was ample room. Location was great, just a 15 min walk to the central train station. The host was very proactive, keeping in touch before and day of travel. We had a small issue with the key box and she sent someone right away. Overall a great experience and would book again. Apartment was perfect for my family of 5. Very clean, great location, and easy access to the public transportation. We would stay here again.